Surprise, Surprise! 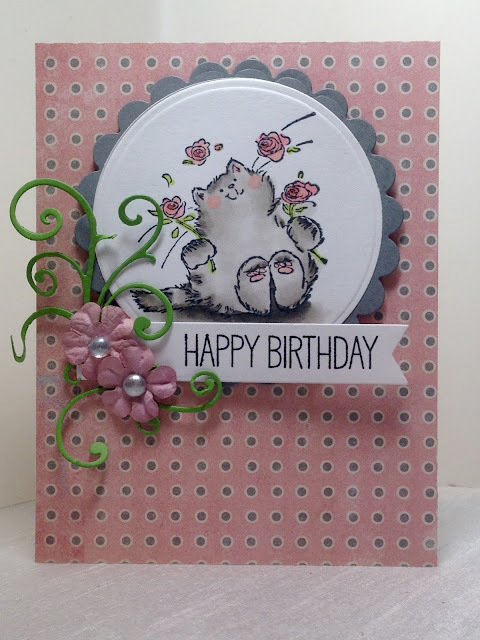 I made it into my craft room to make a card! Well, in all honestly I've been spending a lot of time in my craft room lately, but I've been sewing, not paper-crafting. And if you read Sunday's Home Decor post you would know I was elbow deep in the middle of a renovation. So my paper-crafting time has been reduced to "Essential Cards" only! This was a card I made per request for my son. He wanted to give one of my handmade cards to someone else. I asked him what he would like on the card and he told me "Cats and Flowers", so this is what I created. The main image is from Penny Black "Piece of Heart". I colored it with Copic Markers and put Stickles on the flowers. I popped the main image panel up on dimensionals. The panels were cut with Spellbinder Dies. The sentiment banner and green scrolling leaf was cut with MFT dies. The flowers are from Prima and I put a dew drop inside the center of each one. Cats and flowers are two of my favorite things, so making this card was a pleasure. And of course I had to color the cat grey because my own sweet kitty is a grey stripe too! Thanks Elli! I always forget about card link ups. So pretty! I really should get into making cards someday. 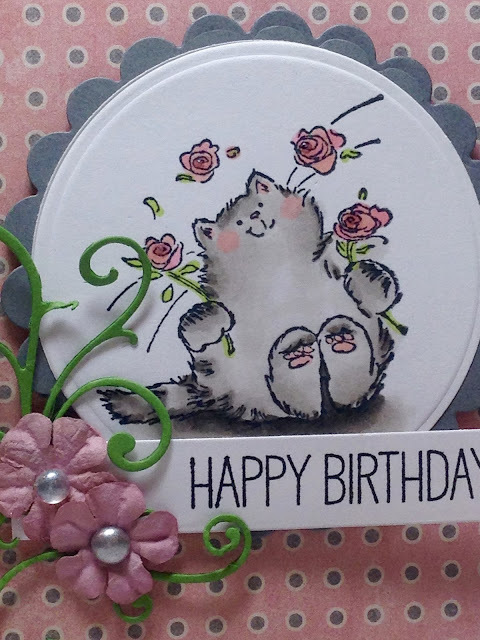 I love the green vines around the flower and the cat is so adorable! Thanks Carrie. People sure appreciate getting a handmade card over a store bought one...or these days an email greeting. I hope my craft room is still where it was 3 months ago when I was last in there. Ha! Good for you to find time to make a little card. Adorable fluffy kitten. Your cards are lovely. Thank you! You're always so funny. I'm in the middle of a renovation now, and it's been over a week since I've been in my craft room. Every winter I think I'm going to have so much time to craft, but it never happens because other projects take up so much of my time. Gosh this is a cute Birthday card, very inspiring!! Thanks for suggesting it Elli! 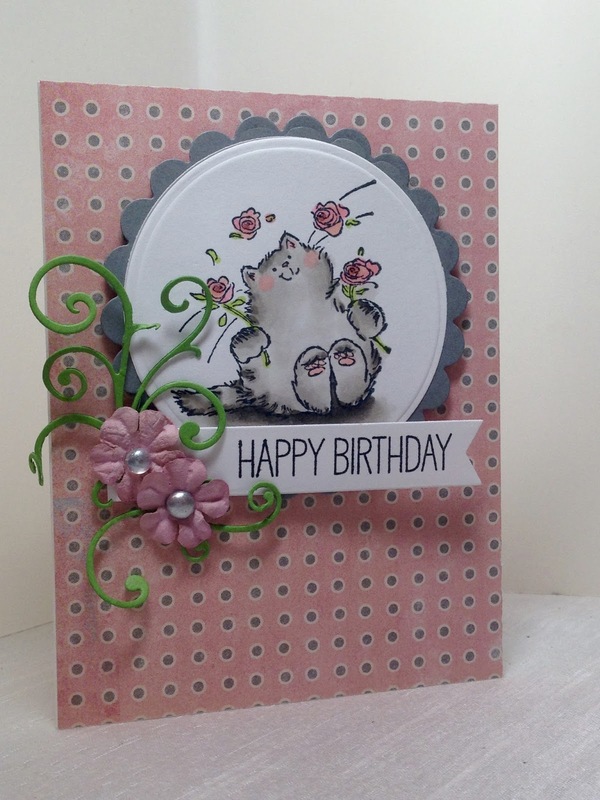 A gorgeous pink and grey colour combination and lovely colouring on the kitty image. Thank you for entering our challenge this month at Penny black and More this month.